Lost Getaway Lakehouse is a newly remodeled vacation rental home on Lost Lake in St. Germain, Wisconsin. With over 2500 square feet of flawless décor and design, this 4 bedroom, 3 bathroom home is the perfect location to explore northern Wisconsin while enjoying all the comforts of home. Bring your own watercraft, sleds and bikes with plenty of space to store safely in the 2.5 car garage. Lost Getaway features a warm, inviting great room with picturesque lake views and cozy updated furnishings. Relax around the fireplace or spread out in the open style kitchen with new appliances and well appointed amenities, perfect for creating a memorable meal for your family and friends. Hosting and entertaining your guests is a breeze with ample kitchen seating and a wrap around deck, perfect for sunset dinners and drinks. Enjoy the spacious common areas or seek privacy in the comfortably furnished bedrooms that can accommodate up to 12 guests. With knotty pine accents and surfaces, Lost Getaway is the epitome of Northwoods style and luxury. 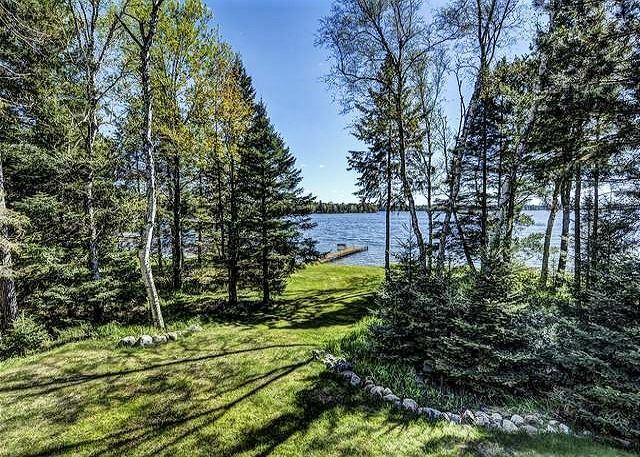 The finished lower level walks out to a perfectly manicured, flat lake front aligned with pine and birch for a private, secluded vacation spot. Explore Lost Lake from your private pier and relish in the nostalgia of your youth as you wade into the shallow, sandy bottom lake front to cool off in the summer heat. Vacationing in the Northwoods offers an adventure in every season; from snowmobiling the 500+ miles of trails in winter, to exploring the lakes by pontoon or paddle board! Located just miles from rental facilities, scenic destinations and shopping, there is always plenty to do, see and explore when vacationing at Lost Getaway. Enlist the friendly staff at Hiller Vacation Homes to help you reserve a pontoon or paddle board, or find local restaurants to celebrate your vacation and indulge while you vacation and make memories with your loved ones. Lost Getaway is also an ideal winter destination with quick access to over 500+ miles of snowmobile trails in Vilas County. Lost Lake is also known for superb ice fishing, offering a quiet secluded location to reel a great catch including Musky, Panfish, Largemouth Bass, Northern Pike and Walleye. Lost Getaway will be featuring new updates in summer of 2019! Guests will enjoy brand new washer and dryer, all new stainless steel appliances a new Foosball table. We will also be introducing a new fire pit area with additional outdoor seating and a log swing to enjoy and take in the views of the stars and lakes. Lost Lake is a very nice lake, smaller and less traffic with a nice sandy bottom for our smaller kids. They loved fishing from the doc and pontoon, swimming from shore, tubing, go-kart riding, mini golf, horse back riding all were very close. The weather was great as well and we all had a great time. We rented this cabin and Lost Paradise next door. Overall every had a great time and the grandparents spent quality time with everyone. Very memorable. We had a special week fishing, swimming, kyaking and enjoying the flee market. I was especially impressed with how clean the home was. We had everything we needed and no steps to the water was a plus. Looking forward to next year.